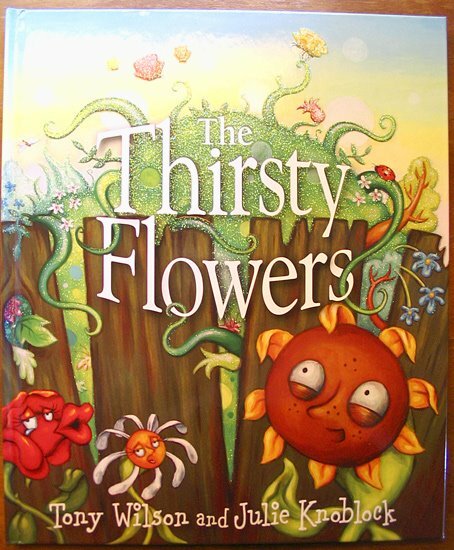 Yesterday I went to the book launch of Julie Knoblock's first children's book Thirsty Flowers. OK, so I missed the actual "launch" part but I got there in time to have a few glasses of champagne and get my new book signed by the author and illustrator. and you know what? it's an amazing book! Jules put so much work into it and it shows. Her orignials adorned the walls in all their glory and looked fantastic. She also had a dummy and a scrapbook of her character devlopment process on display which was really interesting to see, and so very inspiring! Congrats again Jules!! sorry for the bad photo but you at least get the idea. you can also maybe see the fun sparklies on the cover and that are one one spread of the book - so cool!